The ability to regenerate has always stimulated human curiosity and imagination, from ancient mythology to modern regenerative medicine. However, until today, several fundamental questions about the mechanism of regeneration remain unanswered. Where do the cells (skin, nerves, muscles) that form the new tissues come from? How do these cells know which is the missing structure that needs to be replaced? And how do they cooperate with each other to form a new complete and functional organ? Also, why are some animals capable of regeneration, while others – including humans – have such poor regenerative ability? Are there common mechanisms of regeneration in different species? 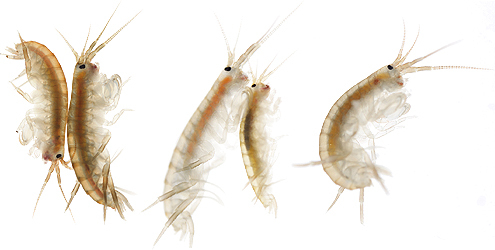 Research carried out in the team of Michalis Averof, and published today in the journal Science, takes a step in addressing these questions by studying regeneration in the small crustacean Parhyale hawaiensis. Nikos Konstantinides, a PhD student, studied the process of limb regeneration in Parhyale using genetic tools that were developed recently in that lab. He set out to map the progenitor cells that give rise to the regenerated tissues, and then compared his results with those of similar studies carried out in different animals. The comparison revealed unexpected similarities: limb regeneration in crustaceans and vertebrates appear to rely on similar progenitor cells for muscle, which are distinct from the progenitors of the epidermis and nerves. More specifically, the crustacean progenitors of muscle resemble the muscle satellite cells that vertebrates use to repair and (sometimes) to regenerate their muscles. Satellite cells are also relevant to human myopathies. These similarities support the idea that muscle regeneration has a similar cellular basis and may have a common evolutionary origin in diverse animals. The study also highlights the value of using different experimental organisms to approach the mechanisms and evolution of regeneration. The research was conducted at the Institute of Molcular Biology and Biotechnology (IMBB) in Crete, Greece, and at the Institut de Génomique Fonctionnelle de Lyon (IGFL) in France. It was funded by the Heraklitos II programme of the European Social Fund and the Ministry of Education in Greece, and by the Agence Nationale de la Recherche in France.